Duane Charles Parcells was born August 22, 1941 in Englewood. The son of an attorney, he grew up in Hasbrouck Heights before the family moved to Oradell in the mid-1950s. As the new kid at River Dell Regional High, he was often mistaken for another student named Bill. Since he was never fond of the name Duane, he just rolled with it, and by the time he graduated he was known to one and all as Bill Parcells. Bill was a three-sport star for the Golden Hawks. He pitched for the baseball team, quarterbacked the football team and played center on the basketball team. After high school, the Philadelphia Phillies tried to sign Bill, but his father frowned upon professional sports as a career choice. Bill decided to go to college and enrolled at Colgate, a school known for its strong academics. Unhappy at Colgate, he soon transferred to Wichita, which had a stronger football program. He was a standout for the Shockers at linebacker, and impressed enough pro scouts to be drafted by the Detroit Lions when he graduated in 1964. A seventh-round pick, he did not survive training camp. Armed with a Physical Education degree, Bill embarked on a coaching career. His first job was as an assistant at Hastings College in Nebraska. He joined the staff at his alma mater in Wichita for a year before being hired by his old high school coach, Tom Cahill, who had been named the head coach at Army. While at West Point, Bill served as a basketball assistant to Bobby Knight. Bill worked his way up the college coaching food chain in the 1970s, with stops at Florida State, Vanderbilt and Texas Tech. He got his first head coaching job in 1978, with the Air Force Academy. In 1979, Bill was offered a job on Ray Perkins’ staff with the New York Giants. He turned it down but a year later he took a job with the Patriots as their linebackers coach. 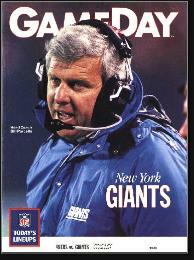 In 1981, Perking wooed Bill again and this time he accepted, becoming the Giants’ defensive coordinator. In 1983, Bill was named head coach. After a three-win first year, the team turned things around and started posting winning records. In 1986, Bill led the Giants to a 14–2 record. The team made it all the way to the Super Bowl, where they defeated the Denver Broncos. Phil Simms, whom Bill had benched when he first took over the Giants, had one of the greatest days of any passer in history. The heart of the team, however, was its defense. Bill had started making big changes when he was an assistant and they were now paying off, especially with the dominant play of the linebackers. Lawrence Taylor, Harry Carson, Carl Banks and Gary Reasons were the keys to New York’s stifling 3–4 defense. The Giants returned to the Super Bowl four seasons later. With Jeff Hostetler filling in for an injured Simms, the Giants defeated the Buffalo Bills when kicker Scott Norwood missed the game-winning field goal. Citing health concerns, Bill announced his retirement after the game. Bill un-retired in 1993, accepting the head coaching job with the New England Patriots. He had a good quarterback in Drew Bledsoe and within four years built a powerhouse defense. The Pats were AFC champions in 1996, but lost to Green Bay in Super Bowl XXXI. After a dispute with owner Robert Kraft, Bill became head coach of the Jets. He engineered yet another turnaround, leading New York to the 1998 AFC Championship Game, where they lost to the Broncos. In 1999, Bill retired for a second time. In 2003, the Dallas Cowboys lured Bill out of retirement. He took the team to the playoffs that season, in the process becoming the first coach in NFL history to do that with four different teams. In 2006, he installed Tony Romo has the team’s starting quarterback and the Cowboys made the playoffs. Bill seemed to be on his way to another Super Bowl when Romo botched the hold on the potential game-winning field goal against the Seahawks in the playoffs. He retired for a third time after this disappointment. In 2008, after two years as a television analyst, Bill returned to the NFL as VP of Football Operations for the Miami Dolphins. He made wholesale changes to the team’s roster and coaching staff, raising many eyebrows around the league. When the dust settled, the Dolphins were AFC East champions with an 11–5 record. Miami’s 10-win improvement over its one-win 2007 season tied the record for the best turnaround in league history. In 2009 and 2010, the Dolphins sat at 7–6 after 13 games. Both seasons they lost their final three games to miss the playoffs and finish 7–9.